Naturalized in the Azores, Madeira Islands, South Africa, Australia, New Zealand, California, Hawaii, the West Indies (USDA GRIN). Presumably the naturalized Australian populations are the ones in West Australia and South Australia, as the others are in states listed as the native range by USDA. Calflora has >300 records in 17 counties in California. The note sent to the Cal-IPC watchlist for this species said that populations are small and it is more problematic along the northern California coast. Of the locations listed in Q1, the Azores, Madeira Islands, South Africa, and Australia (West and South) are similar to California's climate. Calflora has >300 records in 17 counties in California. The note sent to the Cal-IPC watchlist for this species said that populations are small and it is more problematic along the northern California coast. Listed as a noxious weed by the state of Hawaii (USDA PLANTS). Weber 2003 lists as invasive in Hawaii, New Zealand, South Africa, Mexico, the Azores, part of Australia, and the Caribbean, with invaded habitats including forests, grasslands, riparian areas, coastal dunes, and scrub. Weber, E.. (2003). Invasive Plant Species of the World. 548. Of the areas listed by Weber 2003, New Zealand, South Africa, Mexico, the Azores, and part of Australia match California's climate. This species colonizes forest gaps and eliminates native vegetation by shading it out. Seedlings form a dense ground cover. The nutrient-rich litter increases soil fertility. It displaces native laurel forests in the Azores and resprouts vigorously after damage. 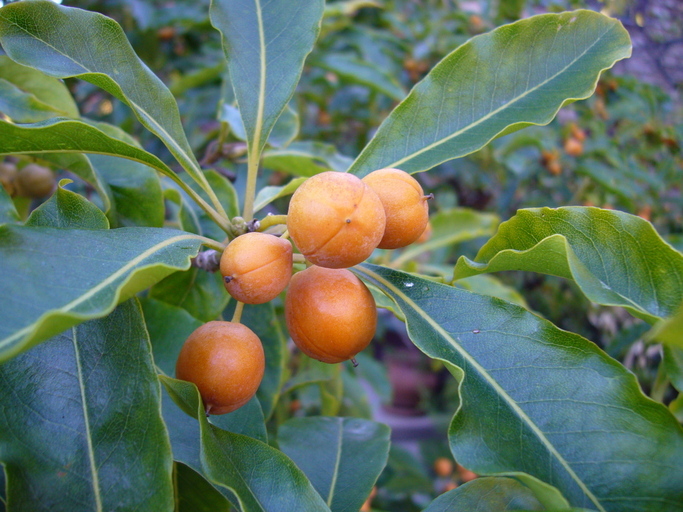 Pittosporum viridiflorum has naturalized in Hawaii and P. tenuifolium has naturalized in Australia and California (GISD). Several other species have naturalized in California (DiTomaso and Healy) but I do not have information on invasive impacts for any of these species. Rejmanek lists P. pentandrum as invasive in the Pacific Islands and P. tobira as invasive in France. Locations in France are similar to California (GBIF). A web search of invasive Pittosporums brought up mostly references to P. undulatum. Florida IFAS lists P. tobira as "potentially invasive." Rejmánek, M., & Richardson D. M. (2013). Trees and shrubs as invasive alien species - 2013 update of the global database. (Pysek, P., Ed. ).Diversity and Distributions. 19, 1093–1094. Naturalized in the Azores, Madeira Islands, South Africa, Australia, New Zealand, California, Hawaii, the West Indies (USDA GRIN). Native to the coastal belts and mountains of southeastern Australia (GISD), which are similar to California (Australian Herbarium). GBIF shows some locations in southern Europe and South America in addition to what's listed by USDA. Except for South America, Hawaii, and the West Indies, the locations where it grows are mostly in areas similar to California. Answering yes. This species colonizes forest gaps and eliminates native vegetation by shading it out. Seedlings form a dense ground cover. The nutrient-rich litter increases soil fertility. It displaces native laurel forests in the Azores, forming monospecific stands, and resprouts vigorously after damage (Weber 2003). Seedling densities can reach 5000 per m2 (GISD). References did not mention any connection to fire for this species. Produces sapponins, which are not very toxic to humans but can be toxic to fish and have been used as fish-killing chemicals (GISD, quoting Plants for a Future). As this species can grow in riparian vegetation, it is possible these could fall into the stream but the reference does not specify which part of the tree contains the chemicals. Answering with medium confidence based on lack of details or specific examples. Weber describes it as having low and dense canopies, thick enough to shade out native vegetation. It is a bushy tree. Based on this description and the fact that it can form monospecific stands, it seems likely to create impenetrable thickets. According to Sunset, roots are strong and become invasive with age. Roots resprout vigorously after damage (Weber 2003), which matches the criteria for root sprouts in this question. No information, although some species of trees can root from pieces. Pittosporum species produce conspicuous fruits that are the size of peas (Sunset). Fruits contain 12-22 red brown to black seeds (Weber 2003). Fruits produce 12-22 seeds each. Weber describes it as producing large quantities of seeds. Producing 1000 viable seeds would require 83 fruits with 12 seeds each (assuming 100% viability) or about the same number of fruits with 22 seeds and 50% viability. Given the size of the tree, this seems possible. Seedlings form a dense ground cover. The species rapidly colonizes forest gaps. Given this description, it does not sound like any special conditions are requires. Calflora/ the Jepson Manual lists the bloom time for California as November through July. Given this long period, production of seed for more than three months seems possible. Sticky seeds are dispersed by birds and mammals. Birds and mammals are described as the main source of dispersal. Reviewed by Tim Hyland, California State Parks. JJM added notes from Plant List Committee conf call in 2015 to determine if we should add Victorian Box. Randy Baldwin, San Marcos Growers, and others agreed that the suitable range for invasion was narrow, and the most dense population had not moved beyond its area in over 150 years. Deeemed a lower priority plant among the invasive risks.